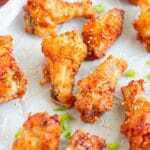 This Crispy Korean Air Fried Chicken Wings recipe is delicious, sweet, sticky, and a little bit spicy. The Air Fryer provides the perfect crunch to these wings without all the added fat from frying. This post contains affiliate links, please read my full disclosure here. So here’s a fun fact about me…I am not the biggest fan of traditional fried chicken. Only a few close friends know this fact because I live in the South and in the South, everyone loves fried chicken. However, fried chicken should be doused in a delicious sauce after it’s fried to perfection. This must be why I love Korean fried chicken so much. 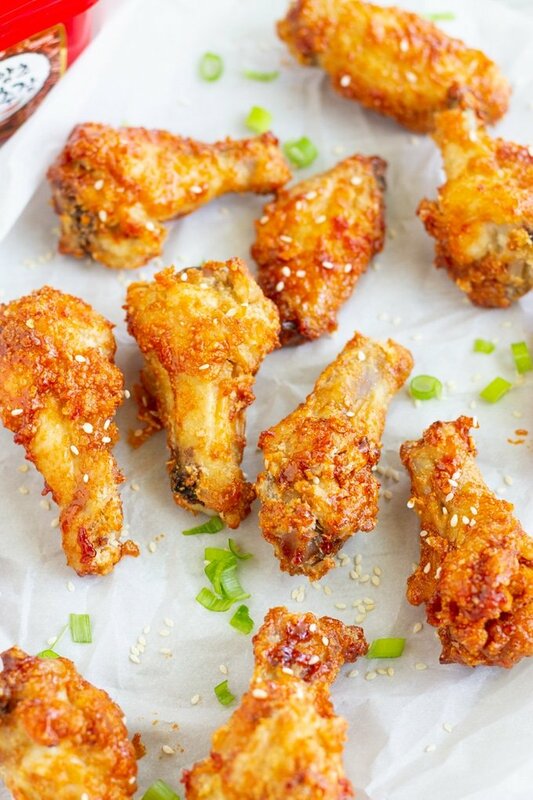 Korean Fried Chicken is fried chicken that has a super crunchy exterior, yet juicy interior. Therefore, the chicken is usually double fried in oil and then covered in a delicious spicy, sweet and sour type sauce. Any part of the chicken can be used to make Korean Fried Chicken. Korean fried chicken is popular for the spicy sauce that it is covered in. The main ingredient to this sauce is a spicy Korean paste known as gochujang. The good thing about this paste is there are different heat levels. I used the mild for this recipe so I could enjoy the flavors more but the paste can be extremely spicy if you are not careful. Why make these chicken wings in an Air Fryer? Most Korean fried chicken is double fried in oil. Part of me wanted to find a healthier alternative but another part of me didn’t want to do all that work. 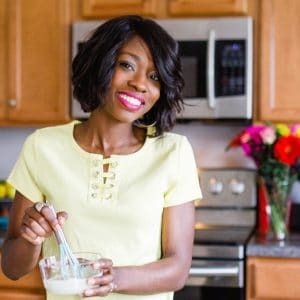 Blame it on the baby, work, life…but if I can simplify a delicious recipe then that’s what I’m going to do. Coating these chicken wings in cornstarch and frying them for 30 minutes in the air fryer was easy, fast, and healthy. 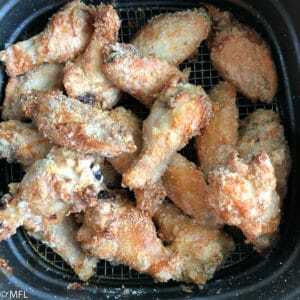 How to Make Korean Air Fried Chicken Wings? 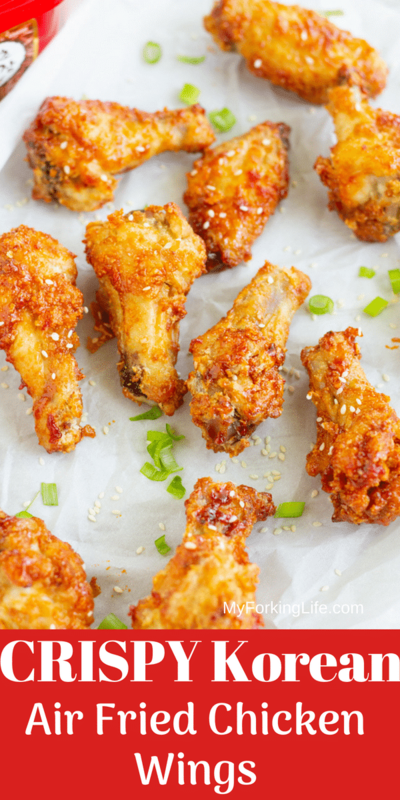 Creating Korean Air Fried Chicken Wings is easy. You don’t even need to preheat the air fryer. Just set the temperature to 390 degrees, season the chicken wings, cover them in a corn starch, and cook in air fryer for 30-35 minutes. Make sure when coating the chicken wings with cornstarch, that you shake off the cornstarch from each piece really well. You want the chicken wings to be completely covered but you don’t want too much excess corn starch. Pick up each chicken piece with a pair of tongs, tap it against the side of your bowl before placing it in the air fryer basket. As with any air fryer recipe, make sure the bottom of your air fryer basket is properly seasoned with oil so your chicken does not stick. Never use aresole can sprays in your air fryer. Invest in a good quality spray oil bottle. I use this brand. 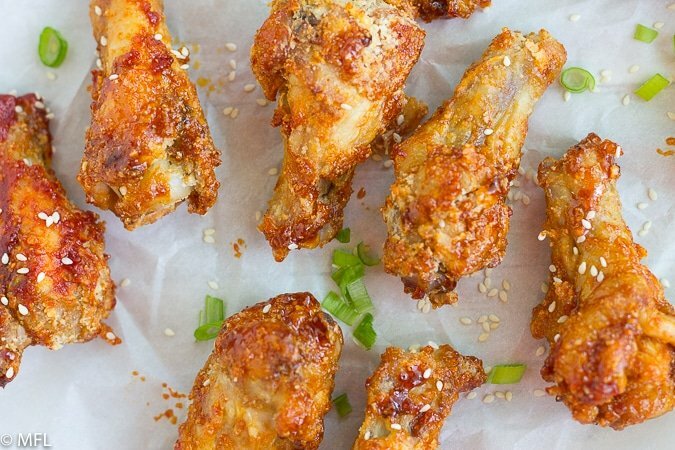 These Korean Chicken Wings are made in an air fryer with no oil. Just as tasty as the deep fried version but much healthier. 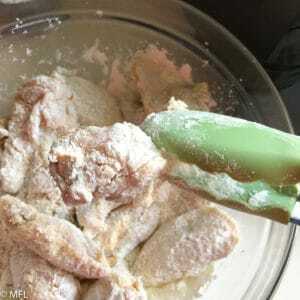 Rinse and dry chicken wings with a paper towel. Place in a large bowl and season with garlic powder, onion powder, and ½ tsp salt. Cover chicken with corn starch and use kitchen tongs to stir, ensuring all chicken pieces are coated. Tap each piece of chicken on the side of the bowl (to remove excess starch) and place it in the air fryer basket. Close the basket and cook chicken wings at 390 degrees Fahrenheit for 30 minutes, turning and rotating chicken about every 10 minutes. Add the sauce ingredients into a small saucepan over medium heat and whisk until combined. Bring the sauce to a boil and reduce the heat to low and simmer for 5 minutes. Remove from heat and set aside. 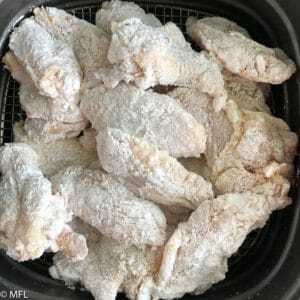 *Oil may be used to spray and coat the chicken pieces if cornstarch still appears on chicken after frying. It can be done without oil as the chicken will produce it's own oil once cooking. The sauce provided in this recipe is enough to lightly coat 2 lbs of chicken wings. If you desire more sauce, feel free to double the sauce ingredients. I’d suggest serving Korean Air Fried Chicken with a nice quick pickled carrot. 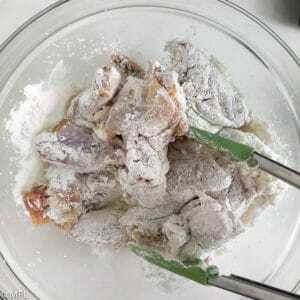 Season chicken wings with garlic powder, onion powder, and salt. Then cover with cornstarch. Use plastic tongs to stir and fully coat the wings. Shake each chicken wings to remove excess starch. 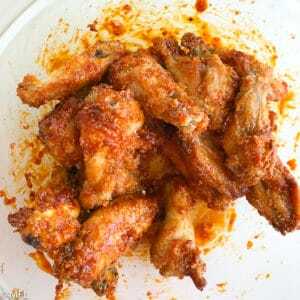 Place wings in air fryer basket. Cook at 390 for 30 minutes, shaking and rotating chicken every 10 minutes. 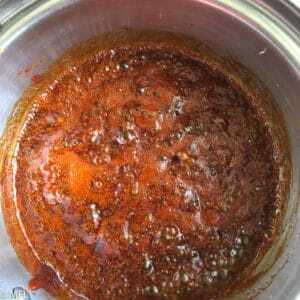 Make sauce while chicken is cooking in air fryer. Your chicken will look like this when done. Don’t worry about the starch showing, it will be gone when covered in sauce. Place wings in big bowl and toss with sauce. Looking for more Air Fryer recipes? Try my Perfect Air Fryer Steak or Healthier General Tso’s Chicken in the Air Fryer. These came out amazing!! So Good!! It looks great, I will be attempting tonight! Why do you not recommend using aerosols can oils to coat the air fryer? Hi Sandy, Over time, some aersol spray cans can eventually cause wear and tear on your air fryer basket. I made the mistake initially with my first Air Fryer and the peeling started to come off of my basket after a while. I recommend buying a spray bottle and filling it with oiL. Thank you for the recipe just made the wings first time using my ninja and I love it.. keep the recipes coming.. Awesome, so glad you like it. I’ll def be bringing more wing recipes too…they are one of my favorite things to make in the Air Fryer. Just made this, it is really good! Thank you Tanya 🙂 One thing I recommend is putting the wings back in the air fryer after coating with the sauce, flipping every 1-2 minutes so the sauce doesn’t burn. It gives it additional flavor /crispiness and is close to the original Korean twice fried recipe. Thanks again for posting this! Thanks so much for the feedback. 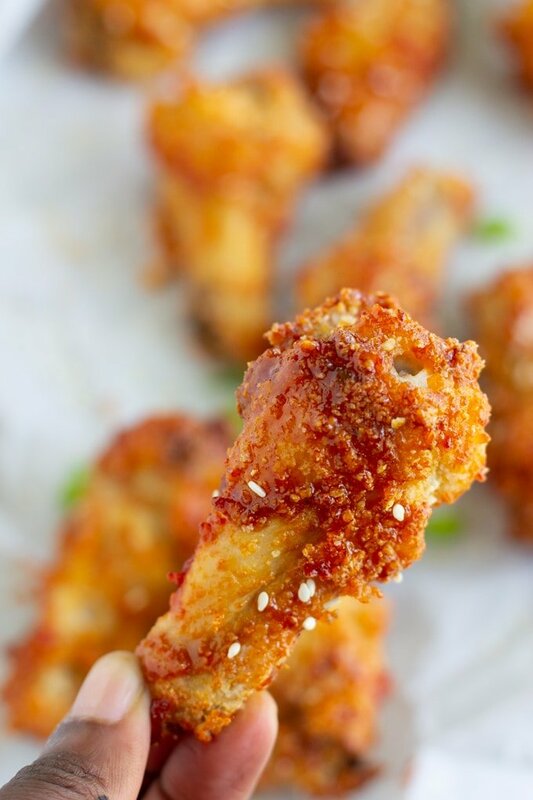 Such a great idea for throwing those wings back in the air fryer for that extra crisp.